The nights are drawing in and there’s a chill in the air; there’s no question that winter is approaching, and with it comes cold and flu season. All of a sudden we’re surrounded by people coughing and sneezing in our workplaces and on our commutes. This year, be prepared with our top tips to stay well this winter and do what you can to safeguard you and your family from getting sick. Whilst the common cold is caused by a virus, not by the weather, it’s thought that it’s more prevalent in the winter months as the colder conditions allow it to multiply and spread more easily, together with the fact that we are likely to spend more time indoors. In office environments and shared spaces, the cold and flu virus can be spread easily on desks, telephones, photocopiers and door handles etc. Wrap up warm and go outside for a walk. This time of year, we can often spend a lot of time indoors with centrally heated or air-conditioned re-circulated air. If you see someone coughing and sneezing, keep your distance as much as possible. 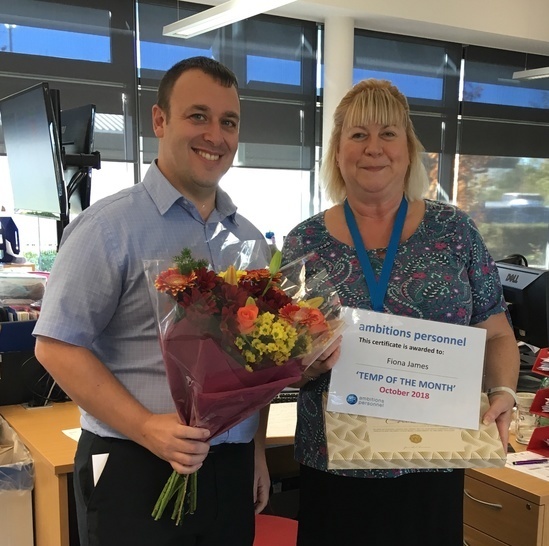 Congratulations to Fiona James on winning the October 2018 ‘Temp of the Month’ award. Fiona has completed a number of temporary assignments over the past months, and has always proven to be a very reliable and strong temporary administrator. Our client has given us consistently excellent feedback, saying it had re-built her trust in agency staff! Pictured is Fiona collecting her prize from Ambitions Personnel’s Lee Sargent. A new feature for our blog, we’ve put together a series of guides to living and working in the towns and cities where our branches are based. Written by people with the lowdown on all things local, these will be a must-read if you’re considering relocating. First up is our head office location of Lincoln. 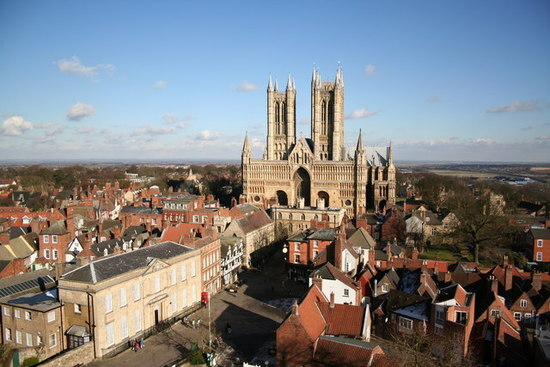 Lincoln is most famous for its historic ‘uphill’ quarter. Sitting atop the rather aptly named ‘Steep Hill’, the Cathedral was once the tallest building in the world, and the castle holds one of four original copies of the Magna Carta. In the uphill and Bailgate areas, there’s plenty of independent cafes, pubs and restaurants to try; once you’ve finished exploring the cobbled streets. Head down Steep Hill to Lincoln’s High Street and St Marks areas, where you can find many big brand shops along with independent retailers. Nightlife in Lincoln has been much improved since the arrival of the University, with a wide range of bars and clubs to choose from. Lincoln is currently seeing wide-scale development with a new transport hub, and the current regeneration of the ‘Cornhill Quarter’ in the City Centre. A visit to Lincoln’s famous annual Christmas Market is a must; held over the first weekend in December, German-style chalets transform the uphill area into a wonderland of festive sights and smells. Why not also pay a visit to Sincil Bank and soak up the match-day atmosphere and watch Lincoln City Football club in action. Our Head Office is conveniently located just a 5-minute walk from the Train Station, near St. Marks shopping centre. We’ve been established in Lincoln since 1990, so we know the job market inside out. If you’re considering moving here and want to find out more about the types of roles available then speak to one of our consultants who’ll be happy to help. We recruit for permanent and temporary roles across a wide variety of industries, from warehousing, factory and driving, to office-based roles at all levels, including HR, marketing and accounts. Entry level roles in industrial sectors such as factory and warehousing are usually paid at the National Minimum Wage / National Living Wage rates, but can sometimes attract a premium for overtime or shifts. Large employers will often use a recruitment agency to help with peaks in demand, and often offer permanent contracts to agency workers. The average starting salary for an Administrator is between £16,000 and £18,000 per annum. The city centre itself is small enough for everywhere to be accessed by foot. However, if you want to head further afield then Lincoln has a newly regenerated ‘transport hub’, encompassing a brand new bus station and improved links to the train station. The move has created an increase in services in the city, making it easier than ever to get about. House prices in Lincoln are very reasonable compared to other areas of the UK, which is encouraging if you’re thinking about moving to the city. A 2 bedroom property in the city can be snapped up for around £90,000 – £120,000, whereas average rents are around £500 per month. If this has piqued your interest in living in the city, and you’d like to know more about the opportunities we have in Lincoln, click through to our jobs page here. Whether it’s for work, school or socially, whether it’s to 10 or 1000 people, the thought of having to address a room full of people is enough to bring some people out in a cold sweat. And if this is you, you are not alone; research has shown that a fear of public speaking ranks higher than a fear of heights or snakes! Even royalty aren’t exempt; it’s been said that even Prince Harry isn’t a fan! One way to deal with it is to simply avoid situations where public speaking would be necessary, however, there may be times where you’re faced with no choice. Just simply by accepting the fact that you are going to be nervous, and that it’s a perfectly natural response to the situation, is the first step. Unless public speaking is your day job, it’s unrealistic to expect that you’re not going to have some level of nerves in the lead-up and/or on the day. Take the steps you can to help counteract your nerves, things such as breathing exercises, gentle stretching and general self-care (being well rested and eating a light nutritious breakfast etc. ), might be useful. It might also be useful to remember that some nerves are actually good for you, the adrenaline is your body’s way of making sure you’re alert and ready. It also shows it’s something you care about, so channelling this passion can help engage your audience. Before you put pen to paper, think about why you’re giving the speech, what the purpose is and what outcome you’re looking for. 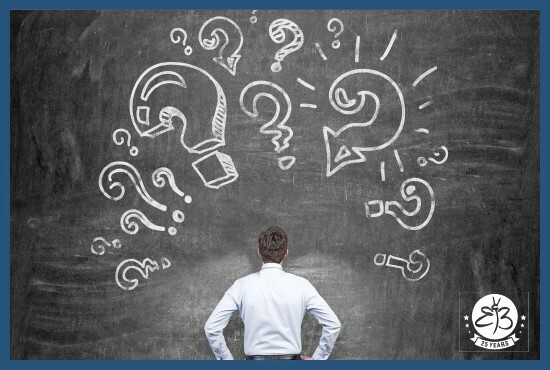 Research your audience; what knowledge level do they have already and in what tone do you want to address them? Think about presentations you’ve seen yourself; what did you like or what didn’t work? Are you going to use any props or a slideshow? Remember to use Powerpoint sparingly; to highlight key messages or show images/infographics, avoid blocks of text. If you are giving a presentation then we have some separate advice covering all aspects of them here. Many of the best presenters will start with something to grab the audience’s attention, possibly a fact, statistic or an anecdotal story. Once you have gained the audience’s interest initially, statistics show that you have up to 20 minutes before their attention may wander; so make sure you can be concise without losing your message. 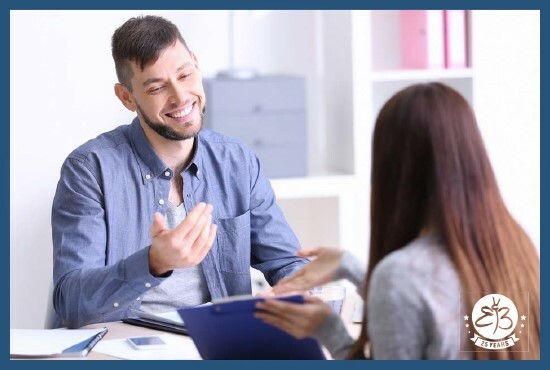 Add a personal touch where you can and aim to speak conversationally, it will help the audience relate to you on a personal level and boost your credibility. Finish on a strong note, with a summary or statement that will be remembered. Some people are advocates of only writing an outline or pointers, to avoid sounding like you’re simply reading from a script, whereas for some, it might provide more comfort to have the full speech down on paper. Either way, practice as much as you can – saying it out loud is a must! Deciding what to say is only half the battle, how you say it is just as important. Firstly, aim to speak clearly, with confidence and passion. The tone of your voice can make up for a thousand words, and really helps keep the audience engaged. Pause to take a breath or a sip of water after making a key point, it gives the audience time to really digest what you’ve said. A speech or presentation should not be delivered at your normal conversational speed, plus most people tend to speed up if they’re feeling nervous, so a good rule of thumb is that if you think you’re going too slow, you’re probably ok! Whether you’re seated or standing, your body language is important; keep it open, and use your hands to enhance what you’re saying. If you like to move around, this is fine, but avoid pacing up and down too much as this can distract from your message. Eye contact is key! Instead of simply looking in the general direction of the audience, try picking out a few friendly faces and making eye contact on rotation. Above all, smile! Remember that the audience are there to see you and most will want you to succeed! Mindfulness is one of those words that seems to be everywhere at the moment, but what does it really mean? Mindfulness is defined by mindful.org as ‘the basic human ability to be fully present, aware of where we are and what we’re doing, and not overly reactive or overwhelmed by what’s going on around us’. We can do this by becoming an observer of yourself; your thoughts, sensations, feelings and emotions. The key is to try your best to do this without judgement. The good news about mindfulness is that you already have everything you need, and the more you practice, the more you’ll reap the benefits. How can I be more mindful at work? Stop what you’re doing and consciously bring all of your attention to your breathing. Follow your breath as it enters your body and as you breathe out. If you get distracted or your mind wanders off, just acknowledge that and bring yourself back to focusing on your breath as you inhale and exhale. Even a few seconds of mindful breathing can be a powerful way of reconnecting to the present moment. We’re often going about our day to day lives on auto-pilot. Even once you’ve experienced the benefits of mindfulness, it’s easy to forget to be mindful! Set an alarm on your phone, so when it goes off it’s a reminder that you have an opportunity to take a step back and observe what is going on for you in present moment. Studies have shown that how you perceive stress can affect how it impacts you. If you tend to think of stress in a negative way, try thinking about how stress can actually help you. When you are facing a challenging time at work, notice your heart rate and your breathing. Be grateful that stress is energising your body and making you more alert, preparing you for the task ahead. Mindfulness is all about acceptance. Accepting everything just as it is in the present moment, without trying to change anything. This is something that can be applied personally (accepting all of yourself, exactly as you are – even the bits you don’t like), but also in work situations. Research shows that multi-tasking is actually ineffective as it’s pretty impossible to really do two things at once. Prioritise your workload and/or create a to-do list. Tackle one task at the time and give it your full attention. If your mind wanders, just bring it back to the job in hand. Taking phone calls? Do it mindfully, really listen to the person you’re speaking to rather than jumping ahead and planning your response. One of the ways mindfulness can be cultivated is through meditation. The practice of meditation has roots in many ancient religions and cultures going back over two thousand years. In more recent times, teachings have been adapted to the modern world and made accessible for all. There’s a wealth of free information available online, recorded meditations to follow and downloadable apps. Meditation can be done whilst seated, walking, or even while doing other forms of exercise, such as yoga. It’s not always going to be practical to do this one whilst actually at work. But by building a regular meditation practice into your daily routine, the benefits will continue into your working day. Or why not try organising a group meditation or yoga session during your lunch break?